Did you know that chocolate is considered a brain stimulator and cough preventor, and that it has anti-diarrhoeal and anticancer agents? Some also say that it’s an aphrodisiac. The Aztecs and Maya must have know all of this as they have been using chocolate in food and drinks since about 1100 B.C. Chocolate played a special role in both Maya and Aztec royal and religious events offering chocolate to the deities and serving chocolate drinks during sacred ceremonies. That’s what we did last night for my mom’s 75th birthday – well, the serving chocolate at a ceremony; not the offering chocolate to the deities. Although we probably should have because it was so delicious and rich and other-worldly. I found this recipe in Joseph Shuldiner’s Pure Vegan cookbook – it calls for lots of good quality chocolate and packs a massive punch. Beware, this is more like a truffle than a torte so cut very thin slices and feed the masses. It goes a long way and puts a satisfied smile on each and every face. In a food processor, combine the flour, powdered sugar, cocoa powder, salt and shortening and pulse until the mixture is evenly blended. Add the water 1 tablespoon at a time while continuing to pulse. Stop as soon as the dough starts to come together. Test by pinching a bit of the dough with your fingers. If it sticks together, it’s ready. If not, add more water. Transfer the dough directly into a 9-inch tart pan and gently press it into the pan. Begin by building up the sides to form a 1/4 inch thick wall of dough. Then distribute the remaining dough evenly over the bottom of the pan and press firmly so the dough is packed down. Prick the bottom of the tart shell with a fork 12 to 15 times to prevent the crust from puffing up during baking. Cover the crust with a clean tea towel and refrigerate for 15 minutes. Line the tart shell with parchment paper and spread pie weights or dried beans over the paper, pushing the bulk of the weights to the edges of the shell. Bake for 20 minutes. Remove the weights and bake for 4 to 5 minutes, until the bottom of the shell is firm and dry. Remove from the oven and let rest while you prepare the filling. 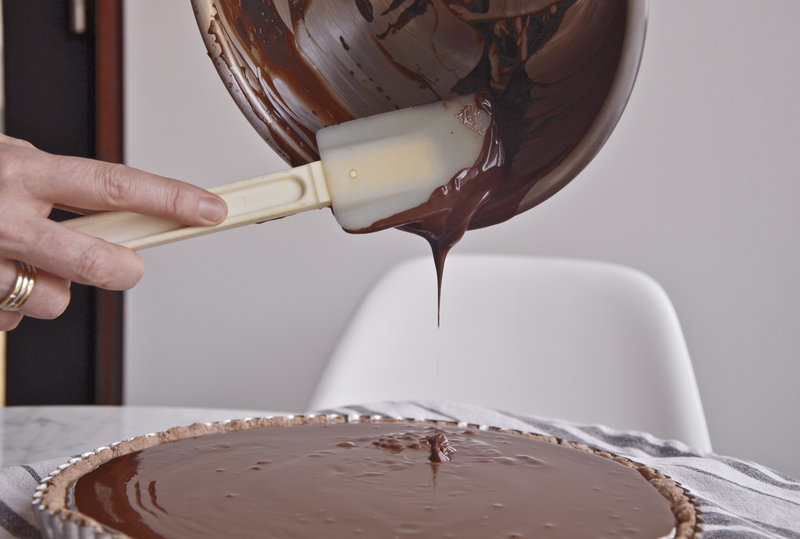 For the filling, put the chocolate in a medium heatproof bowl. In a small saucepan, heat the soy milk over medium heat until it begins to steam and almost comes to a boil. Add the salt and stir until dissolved. Pour the soy milk over the chocolate and let stand for 1 minute, then stir until the mixture is smooth and the chocolate is entirely melted. Pour the filling into the baked tart shell and use an offset spatula to spread it evenly. 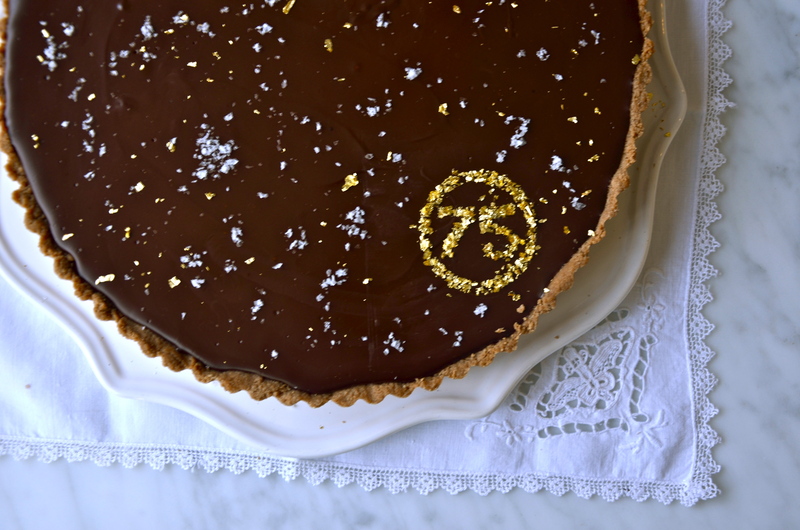 Give the tart a gentle but firm rap on the counter to settle the filling and remove any air bubbles. Let the tart cool to room temperature, which should take about an hour. 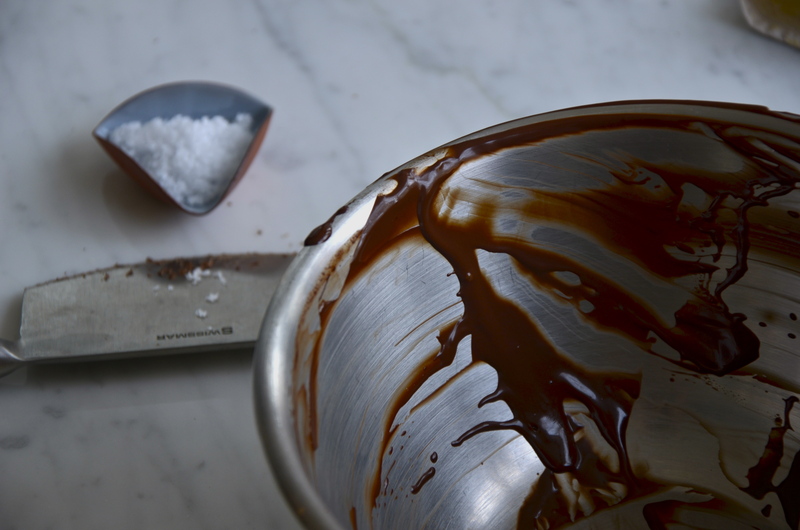 When it’s completely cool, sprinkle the fleur de sel evenly over the top and serve. Oh my, this looks ridiculously good! Chocolate and sea salt- my favourite! Thanks Heather – we’ve been eating it all weekend. It is crazy delish. One word: “CHOMP”. Want some!!! !